This gives me the opportunity to make something I have always wanted, to keep for myself. I have made several in the past in various sizes, but I have never kept one, although she is one of my favorite pieces! I only hope that I can do justice to this instructable and to those reading it, so anyone who wishes can make one for themselves. Following these instructions you should be able to create your own work of art in glass at home Don't let stained glass become a dying art form! NO eating, drinking or smoking (you may have pieces of glass or chemicals on your hands that will transfer to your mouth and cause harm). NO bare feet or open tow shoes (and although I am known as the barefoot bohemian I do wear moccasins when working. There are almost always slivers of glas or metal on the floor! NO cchildren under the age of 12. NO unattended persons are allowed in the shop at any time. 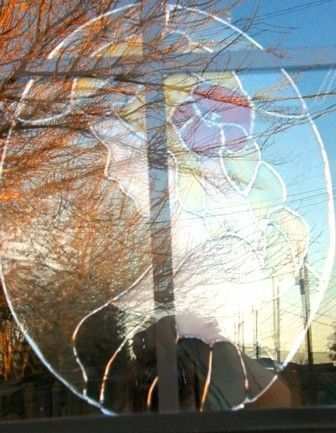 If you chose to follow this instructable to make you a stained glass piece, please follow ALL safety guidelines. Decide on the size you want your finished piece to be. I am making the one 11" x 15". You will want two copies (minimum) of the pattern. Since this is a design I tend to make often, I cover one pattern in clear contact paper to protect it from moisture. Next choose the colors you want for your piece. This is an Irish maiden and green is my favorite color so have chosen green for her dress and head piece, red for her flower and a yellow/golden yellow for her hair, for the skin I have chosen a pale pink/flesh tone. Make sure all your glass is clean before starting. Lay put your pattern on a light table to begin tracing the pattern. When tracing pieces it is best to leave at least 1/2 inch or more between pieces. Although this may seem wasteful, it is far less wasteful than losing multiple pieces due to breakage when cutting too close together. Use a marker that will be easily visible on the surface of the glass. China markers work well, and will stay intact somewhat when grinding the glass. I have not found any marker that will stay on throughout the entire process of cutting and sizing the piece. All glas has a right and a wrong side to score on. Even in the smoothest appearing glass, you will a "grain" or pattern that lets you know which side or the glass was on the bottom during the glass making process. You want to score your glass on this side, and it is best for you to mark it on this side. There are different levels of quality in glass. Many hobby stores which carry glass will carry "end run" pieces. This is the glass that was literally at the end of the run, and is often filled with bubbles, fractures and stress areas that can make scoring it cleanly difficult. It is best to get your glass pieces from a reputable glass dealer. The extra money will pay off in less scrap glass in the end. I keep a no scrap policy for my shop. Not that there isn't left over pieces after scoring out a pattern, but even the tiniest pieces can be put to use in some way. I keep bins for my "scrap", and it is used in other projects or sometimes sold in bulk to people looking for glass for mosaics. Now that you know which glass you want to use, and which side is up, Start marking out the pattern pieces to be scored. It is a good idea to number your pieces so you don't have to search and guess as to where they go later. This is particularly true with patterns that contain a large number of pieces. Some patterns may contain 10's of thousands of iindividual pieces. If you have ever cut out cookies, you can apply this idea to marking out your pattern. However, you cannot squish up and re-roll the glass like cookie dough. You may l want some pieces to immitate the real life items they depict. Such as fabric and material. You may want to use a pattern that allows it to look as though it is draping. Hair is definitely one of these circumstances. To make the glass look more like hair I have chosen a glass that is "swirled" and streaked with various colors of yellow and orange. Notice in the photo that one side of the glass looks completely different from the opposite side. With light going through the glass these two sides blend to form their own distinct pattern. I looked at the side that was to be the main side in view and chose to follow the streaks so that the hair would "fall in place". Since this was the opposite of the right side for cutting I had to mark the score lines backwards, so that the end product would be as desired. This is also where I broke the rule of not cutting pieces too closely together. I chose to make the braid one long piece and then separate the pieces after. This can be difficult and risky and often will cause breakage where u do not want it. If that occurs you will just have to score out a new piece and do the best you can to match the pattern. *Seperating close pieces is when a glass saw can be very useful. A glass saw is handy for intricate areas or (breaking the rule of separating your pieces). I chose not to use my saw to show these cuts as they are possible without the investment of a saw. Glass saws can be quite expensive and bulky in a small shop. Breaks do happen, no matter how exacting you are and no matter what your experience level, they are just bound to happen. Step 3: Check to Make Sure the Pieces Fit. This can be one of the most frustrating parts of making a stained glass piece. 1/16 inch may not sound like much, but when trying o get all the pieces to fit together it can see like a huge amount. Check each piece to the pattern, grinding and resizing as needed. You may even find you need to cut a new piece entirely. The closer they pieces are situated, the better the soldered seams will appear when it is finished. You may have to do a lot of grinding, but be aware that a coarse grinding head can easily remove a lot of glass. Grind only a little before checking the fit. You can always take more off, but if you take off too much you will have start that piece all over. Grinding also gives the glass a better surface for the foil to hold onto later when you foil the glass. Wash all the glass to remove any residue and ground glass. For this thickness of glass use 7/8 inch copper foil. I chose a silver back since it will be visible through the architectural (clear) glass and I want it to match the solder. Copper foil coes in various widths for different thickness of glass or different applications. It comes with a plain copper backing, silver backing and black, and also come in some designs for decorative uses. Be sure to center the foil on the edge of the glass. There are many different tools available to assist in foiling. Most of them aren't worth the money spent on them, however I have found the foiler pictured to be quite helpful since I don't always have the steadiest of hands. It is very inexpensive and easy to use. The only draw back is that you would need one for each different width of foil, and that would make it useful only for that one width of glass. To foil the glass, starting at least 1/8 inch away from a corner, carefully center it on the glass and press is down while removing the paper backing. Corners and sharp turns, cut the foil so that it will lay flat on both sides of the corner. Allow a slight overlap when you have come around the entire piece. Once all the pieces are foiled you need to use a fid, or my favorite is an old pencil, to burnish down the foil so there are no creases or bumps and the foil is adhered well to the glass. If the foil is not completely stuck down, flux will seep under it and the foil will not hold. Burnishing down the foil also makes for a cleaner solder and better bead. If there are places where the foil appears wider, use a utility knife to score away the extra foil and even it out. Now is the time to fix any problems with the foil tape because once you have fluxed and soldered it is very difficult to remove and clean the area and get new foil tape to stick. Tinning is NOT soldering and definitely not the same as running a bead of solder to join the pieces of glass. You need to apply flux to the foil tape and with your soldering iron set at about 6-7 on the rheostat (this will be 60-70% of your soldering irons full power) take a small bit of solder and clover the foil with it. Tinning is simply applying a thin layer of solder to the copper foil in preparing for soldering. Once you have tinned all the pieces, refit the pieces according the the pattern. Use the aluminum stick pins in the cork board to keep the pieces in place and as close together as possible. Use a small bit of solder to tack solder the pieces in place before soldering. Unlike tinning and other types of soldering, you want to keep your soldering iron just slightly above the area you are placing the bead on while holding the solder just behind the tip. Do not go back and forth on the solder, move only in one direction. If your bead does not come out how you want it, apply more flux and re-do it. Do not try to fix it by going over the area you want to change. A proper bead on a stained glass piece should be at least 1- 1 1/2 times as tall as it is wide.. This can take some practice. Where seams intersect you want to try to draw the one bead into the adjoining one so it appears as one continuous line. I say the "fun part" be because for me anything that has to do with solder is a blast. When I was little I would make solder jewelry when my dad was working with solder. Course no one ever told me that wearing lead probably wasn't a good idea....oops!! Measure the outer diameter of the piece and using lead cutter, cut off a section of sun catcher came. Place it on the lead stretcher and stretch it. This will help to strengthen the came as well as straighten it. Tack solder it at where the bead lines on the piece meet the came. Solder on a sturdy ring to use for hanging. To make rings all the same size, and round; wrap some 18 ga copper wire around a pencil. Slide it off and cut it into jump rings. Wash the piece well with a mild detergent and a soft bristle brush. Dry it with a cloth. Use carnuba wax, or a good quality automotive wax to polish and protect the piece. Depending on the area you live it, you may need to wax the piece every year or so to protect from oxidation. Find a a good window to hang your Irish Maiden, and ENJOY! She will bring rainbows into your room but I can't guarantee the pot of gold. Please leave me a comment, good or bad, and give me a rating so I can continue to make more instructables and improve on them! I just don't know what to say! Scooch said it best! Just amazing. I have been wanting to get into stained glass and you have given me the boost I need! I have a question. Do you order glass or where do you get it? I feel that is my biggest obstacle from getting started. And I love the red celtic knot one! Just beautiful! Silly thing about tat red knot is my hubby had to hide it about halfway through because i was so frustrated i was ready to trash the entire piece! Getting it done made me like it all the more. I have been down sick for a bit, but now that I am back and going I am hoping to make a series of idles on stained glass, just have to figure to how to get it started. Thanks, I do with I had written this much clearer though. Was thinking of maybe doing a series of instructables starting with the glass then working through to leading and some other applications. I think one of my biggest obstacles when I started was getting supplies and finding good instructions on how to do it. I live in a remote area where there aren't a lot of educational outlets. I did find a woman who taught some glass work, and took a few of her classes, but i really seemed to learn more through trial and error, and I made some big errors! In fact the red celtic knot was one of my big errors, but luckily I was able to fix it, for the most part. It didn't turn out the size it was supposed to be because of cutting errors, so i had to remake one for the person who commissioned it, and I kept the "oops" one. But it is one of my favorites as well. I usually do order all my glass. You will get a better quality glass that way rather than buying it from a craft store, even though the prices always look better there. Shipping and crate charges have made it much more expensive to get glass. One of the most affordable ways I have found is to approach churches who are replacing large, solid piece cathedral windows and ask for what is being removed. I have never had one say no. In fact this dove is going to be pieced over some glass that was reclaimed from a church that lost a window due to a BB gun, so I was able to get almost 8x3 feet of solid glass. In fact yesterday, and today will be spent pulling glass out of some windows and hopefully making some pieces for the places that let me do that. We had a nice little storm rip through and take out the electric so It gives me an opportunity and hoping i can give them back something special. If there is anything I know that would help you starting up, please ask me. I love to share what little I know ;). I am sure you will do great and make some wonderful pieces, I would love to see what you come up with! Thank you, and I am sure you could do it. I think it I can learn how then anyone can learn it. Congratulation!! This is such a lovely piece. And your tutorial is full of great information, most of which would have made my one attempt at stained glass much less frustrating. I was never informed of the right and wrong side to score the glass. After around the tenth attempt and many splinters I lucked out. Congratulations again. Very definitely deserved! I think this is just amazing. Thank you for keeping lost art alive. I don't' know if I could ever make something like this, but it is truly lovely to look at. Thank you. And I really do believe it is something anyone can do. After I was no longer able to work in nursing, I taught myself painting, sculpting and glass work. Of course I am still in a huge learning curve, but I hope to be for as long as I draw breath. I believe that there will always be someone somewhere who holds onto the stained glass process, but the more I see of lights hanging in restaurants that were mass produced to make viable facsimiles of leaded glass, the more concerned it makes me that like so many things, cooking included, people will take what they see as an easier and cheaper path, even if it leads to inferior products (or more people eating out on a regular basis and using carry out in place of cooking). And now I'll get down off my soap box lol! PS- love your recipes. I will have to try more of them. I now remember where I saw the soy braised chicken I cut the chicken up for in my instructable. I'll go back and give you a credit there! Very pretty! Where did you get the glass?